This school year, the Steps to Success start with you. This month, families and students across the region will prepare for the start of a new school year. With the opportunity to make new friends and learn new things, this is an exciting time for both teachers and students. However, it can also be a stressful and challenging time – particularly for students who have fallen behind in earlier grades, or families struggling to afford safe housing and healthy meals, or teachers that must use money from their paychecks to buy supplies for their students. As always, United Way is here to help. Education is a huge part of our Steps to Success framework. We are committed to helping students, families, schools and communities start this year off on the right foot. We all can play a role in helping schools get ready for a new school year – from donating supplies for teachers to buying an extra backpack for a kid in need to signing up to volunteer. Here are some easy ways you can help schools in your community. Why is a new school year so important? What is United Way doing to support students, schools and communities? Learn more in our four-part series covering everything from pre-K to high school graduation! Every family wants to help their children start the new school year off on the right foot. And we all do as much as we can to make that happen. But are there specific things that we often overlook? We’re talking to four educators from our region to ask what they think are the most important things for parents and families to do to make sure their kids are ready for a new school year. Read the series. One of the easiest and most effective ways to succeed in school is simply showing up. Read our take on the importance of attendance, then use our tools and information to raise awareness in your community. Today, we know without a doubt that quality early childhood education leads to more success in kindergarten and throughout life. For low-income children, early childhood education is one of the keys to upward mobility. It also leads to a stronger economy for all of us. As we prepare to kick off a new school year, it’s critical that we think about those who are just beginning their educational journey. Learn more about the issue, support United Way and help give young children across our region a successful start. The first day of school is a big deal for any student, particularly young learners headed to “big school” for the first time. 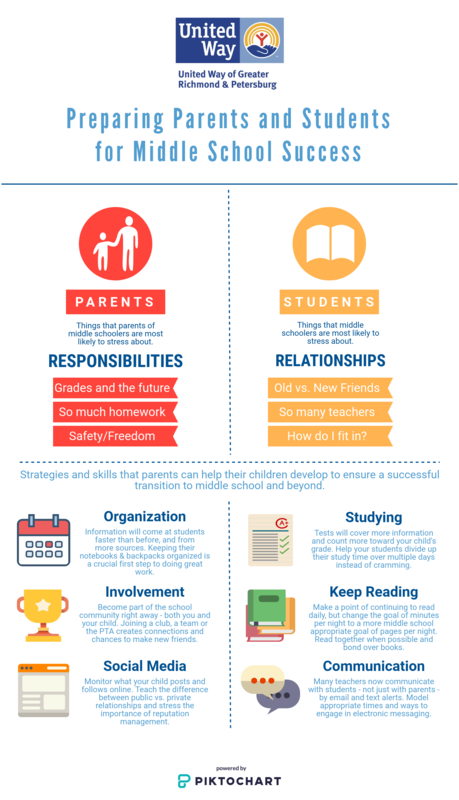 With a new school year upon us, what are some things parents and families can do to help their child start the year off right? Learn more from local expert Shelia Pleasants. What makes kindergarten readiness so important? What is United Way doing to support students, schools and communities? Learn more in our four-part series covering everything from pre-K to high school graduation! Hear from leaders at our funded agencies that support the Prepared for Kindergarten Step. Quality early childhood education has a major impact on a child’s physical, social and cognitive development and helps them prepare for the kindergarten classroom. United Way’s Shelia Pleasants spent 14 years running an early childhood education program in Richmond. Read her thoughts on this important topic. If a young child is not receiving appropriate medical care and is not healthy, it is difficult—if not impossible—for that child to be prepared for kindergarten. We interviewed Margaret Nimmo Holland, Executive Director of Voices for Virginia’s Children, to learn more about this important issue. Read the interview. Fall PALS-K benchmarks help schools identify kindergarten students who are performing below developmentally appropriate levels on fundamental literacy skills and need additional instruction. Smart Beginnings Greater Richmond shared what PALS-K is and what it tells us about school readiness. Read the article. Dive deep into the data about this critical issue by reading the Prepared for Kindergarten section of our 2017-18 Indicators of Community Strength report (and click here to view the full report with data about all nine Steps to Success). Up to third grade, kids learn to read. After third grade, they read to learn. When it comes to literacy, third grade is where the rubber meets the road. A student who is reading at grade level by third grade is significantly more likely to succeed in later grades and graduate high school on time. Unfortunately, one in four kids in our region is not reading proficiently by third grade. In areas of high poverty, the third grade reading SOL pass rate is as low as 61 percent, compared to the state average of 75.6 percent. This school year, learn more about early literacy, support United Way and help ensure all of our region’s elementary-age students are reading at grade level. We talked to Shelby Bartilotti, an Exceptional Education Teacher at Bellwood Elementary School in North Chesterfield, to learn about ways parents and families can help their elementary-age student prepare for a successful start to the school year. Read more. What makes early literacy so important? What is United Way doing to support students, schools and communities? Learn more in our four-part series covering everything from pre-K to high school graduation! Hear from leaders at our funded agencies that support the Third Grade Reading Step. Audrey Trussell, United Way’s Director of the Petersburg City and Schools Partnership, has a terrific explainer on the importance of attendance. Read more. The path to literacy begins at home. How can parents and families help a child learn to read? What should they do if their child is struggling? We talked to Tanya Elliott, a Title I Reading Specialist at Byrd Elementary School in Goochland County, to find out. Read more. As students prepare to read, how do educators prepare to teach? We talked to VCU’s Joan Rhodes to find out how teachers learn about literacy instruction. Read more. Dive deep into the data about this critical issue by reading the Grade-level Reading by Third Grade section of our 2017-18 Indicators of Community Strength report (and click here to view the full report with data about all nine Steps to Success). In many ways, middle school represents a period of transition and evolution. It can be difficult for students to remain engaged and persist into high school, especially for students who struggled academically in elementary school, who have experienced trauma or have mental health and/or identity issues. To increase the chances of success, students must have safe school and home environments, positive interactions with adults and peers and feel a sense of empowerment as they mature into young adults. As we approach a new school year, we invite you to learn more about middle school engagement and find out what United Way is doing to help middle school students in our region. Middle school can be a tough time for both students and parents. We have some tips on what you can do to make middle school a success. Learn more. What makes middle school engagement so important? What is United Way doing to support students, schools and communities? Learn more in our four-part series covering everything from pre-K to high school graduation! Hear from leaders at our funded agencies that support the Middle School Engagement Step. We talked to NextUp’s Barbara Couto Sipe about the importance of after-school programs and how schools and parents can take advantage of these programs to help keep kids engaged. Read the interview. Part I provides an overview of the issue and explains the role of positive youth development in keeping students engaged. Read more. Part II dives deep into the data on how middle schoolers in our region are doing. Read more. Dive deep into the data about this critical issue by reading the Middle School Engagement section of our 2017-18 Indicators of Community Strength report (and click here to view the full report with data about all nine Steps to Success). For many, the path to high school graduation seems like the home stretch before earning a diploma and entering the workforce. For others, it’s the end of one phase of education before the beginning of another phase. Unfortunately, too many of our residents – particularly those in low-income areas – are not graduating high school on time – if at all. One out of every 10 high school students in the Richmond and Petersburg region did not graduate on time. As we prepare to begin a new school year, we invite you to learn more about this important issue and find out what United Way is doing to help students across the region graduate high school on time. We talked to Don Wilms, an award-winning Virginia educator, to learn about ways parents and families can help their high school student prepare for a successful start to the school year. Learn more. What makes high school graduation so important? What is United Way doing to support students, schools and communities? Learn more in our four-part series covering everything from pre-K to high school graduation! Hear from leaders at our funded agencies that support the High School Graduation Step. We talked to Tye’aja Friend, a recent high school graduate and former United Way intern, about her experience and the challenges she faced on the path to graduation. Read more. Dive deep into the data about this issue by reading the High School Graduation section of our 2017-18 Indicators of Community Strength report (and click here to view the full report with data about all nine Steps to Success).